GUI design: How to add other information to the main page of the mobile application? For each row I would like to add the mod cons for the particular service station (ie, "parking", "bathroom", etc.). For example, "Rocket Fuel" has parking, a bathroom and a mechanic. How can I add this information to the list without interrupting the main purpose of the application (show gas prices)? People use the application because it tells them gas prices, but I would like to give them more information without altering the existing flow of the application, or its main purpose. My biggest concern is that the list will be too full, or maybe adding the information will in some way affect what users think about the application. 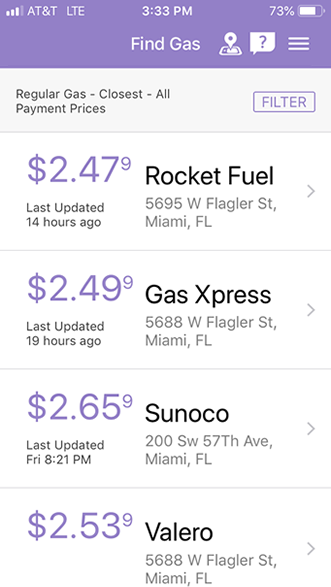 As an additional note, an application such as Gasbuddy (which is similar to our application but does not compete with us) also shows this additional information with icons, but when a user clicks on a gas station. For some reason, gasbuddy decided not to add the icons to the main page. Previous Previous post: How to use Bitcoind walletnotify in bitcoin.conf?